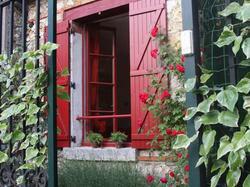 Charming little detached house with a magnificent view over the Seine. The house has been completely renovated and benefits from all modern facilities. You are 5 min. walk from the RER and SNCF train station from which you can reach the centre of Paris in 25 min. and Eurodisney in a little over an hour via a direct line. You will enjoy an ideal location therefore: in the quiet of your house and your garden in a typical small town with its businesses, restaurants and shops; but also close to the cosmopolitan city that is Paris! -Kitchen linen are included in the rental price. -Please note that bed linen are not included in the room rate. Guests can rent them at the property for 8 EUR per person and per stay. -Please note that bath towels are not included in the room rate.Guests can rent them at the property for 5 EUR per person and per stay. -Please note that the electricity fee is not included in the apartment rate and will be charged ? 0,11/kWh. -Please note that the gas / oil fee is not included in the apartment rate and will be charged ? 0,65/m3. This holiday home features a washing machine, dishwasher and DVD player.